Taking improv classes at Dallas Comedy House has changed my life, it’s helped me in my work and personal life more than I ever expected, and one day I found myself wondering if new students felt the same way. I got the pleasure of sitting down with level two student Carlos Ayala, to not only learn more about him, but more about how improv has affected his life! Carlos wearing a real intern shirt while taking a fake mugshot. Carlos: Sure! I was born in Mexico, lived there until I was like 9 and moved here to Fort Worth when I was in 3rd grade. Went to school at A&M for Economics and now I work in Speech Analytics. Madison: How did you find Dallas Comedy House? Carlos: Through Mimi (a performer at DCH)! I met her doing Little Shop of Horrors, I was the voice of the Killer Plant and she was one of the Doo Wop Girls. I was a band nerd my whole life, and I couldn’t do marching band and theater, so I had to pick one and since I had done band for so long I just stuck with that, but I would go my theater friend’s parties and they would play improv games, and I always told myself I wanted to do improv but with so much going on I just didn’t have time. Madison: Well, are you glad you finally made time to take improv classes? Carlos: Absolutely, it’s one of the best things I’ve ever done. 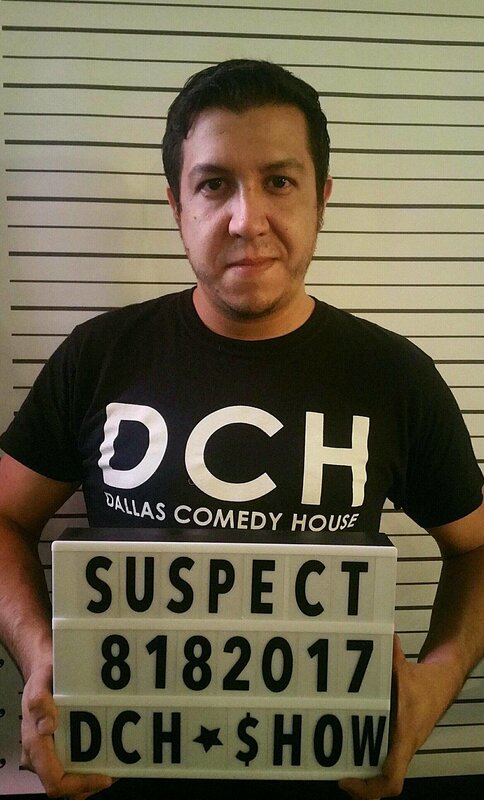 Madison: What’s your favorite thing about Dallas Comedy House? Carlos: Being someone that has been in band and theater, I know a good group when I see it and so when I first came to check it out and watch a show I met some of the people and saw some of the faces and how they like treated each other I just thought, I want in, whatever it takes. Madison: Right? I felt the same way, I knew it was a community I wanted to be a part of when I was completely cool with just coming up here by myself on a Friday night, knowing I’d find someone to talk to or see shows with. Carlos: Yeah! Right? See I’m also an intern here, and the first term I interned here I wasn’t even taking classes yet, I earned a class credit but I wasn’t in classes yet so all I did that first internship was see shows and meet people and that really helped me out, and now I’ve gotten two of my level one friends to intern too, I’m a big evangelist DCH internships. Madison: Interning is one thing I wish I would’ve done, I really do regret it. Madison: No, and I really wish I would’ve because you meet so many people. Carlos: Yeah, and honestly I love the fact that I can watch the shows, because I see things in shows where I’m like, oh they just did that thing that I learned in class! They’re establishing the relationship early on, they’re using yes and! Madison: Who would you say your comedic idol is? Carlos: At DCH or in general? Madison: Just in general, it doesn’t have to be DCH. Carlos: I mean being an intern, I see so many shows so like Ben Pfeiffer, Christie, Amanda, Payton, Scriven, I’m so excited to be in a troupe with him. Some of my non DCH idols, I loved Dana Carvey growing up, Michael Myers, some of the classic SNL members, which I know what is classic to me may not be classic to you but like Phil Hartman, Adam Sandler, Chris Farley. Madison: What was your first impression of your first improv class? Carlos: I mean I’ve played some improv games before so I was excited but a little nervous. See in theater I had to overcome stage fright, because I would memorize my lines, run it over and over and then opening night I’d be like, “Oh no, I have to do this in front of people.” So I finally got over that, but now I am having to go on stage with no script, so it’s something I have to keep working on. I think that if people take improv before they do like stage straight acting it’ll be way less scary. Because then you’re like well at least I have a script in front of me now and rehearsals to work on it. Madison: Do you think these classes you’ve taken at DCH have helped you at places like work or just in general everyday life? Carlos: Well, actually my level one teacher Rob Howe told me that I bring a cathedral to improv scenes instead of a brick, so I’m working on bringing less and less with me, and I found that in a lot of my presentation and business meetings. I tend to drive because I am very particular because I think I know the right way to do it, but by letting go of the wheel you can end up in some really interesting places, in a good way. Carlos Ayala is a level two improv student, you can find him performing in Mouth Noises or his level two showcase on 12/13/17 at 7:30! If you can’t make it then, you won’t miss him smiling and working hard as an intern on Saturday’s! Madison Frihart is a graduate of the Dallas Comedy House improv and sketch program. You can find her working Corporate Training and Private Events for DCH or performing improv and sketch in Impractical Magic, Makin’ Whoopie, Queso Queens, and Walker Mall.